With Gergiev's new Phillips recording of Verdi's Requiem proving something of a disappointment in the composer's centenary year hopes of something special hinge on Arthaus's DVD release of this justly famous Edinburgh Festival performance. It is sensational, one of the most compelling performances I have heard of this work - and a performance Abbado will find hard to match in his forthcoming EMI release of the work. 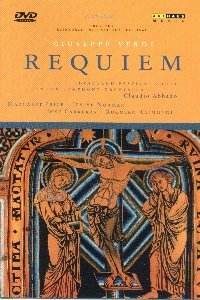 The Requiem is notoriously difficult to cast but here Abbado gets it absolutely perfect. On paper this seemed a quartet of soloists to die for and the performance soon confirms that this is the case - together they make for the most satisfying quartet, possibly without rival, on any recording of the work. The contrast in tone and colour between the four voices is resplendent, the phrasing and care for dynamics extraordinarily refined (listen to any one of Margaret Price's hushed pianissimos to hear how moving this music can sound). Carreras, infinitely more musical than Bocelli on the Gergiev recording, brings gravitas and lyricism to his role in equal measure (the Ingemisco being a particular triumph). Jessye Norman is simply mesmerising, her tone both polished and velvety, the nobility of her phrasing irresistible. Some will indeed resist this, perhaps preferring the lighter hue which Borodina brings to the Philips recording, but it is an example of this singer's supreme artistry. Raimondi is the subtlest of basses, bronze in tone but like a powerhouse throughout. Margaret Price, one of the finest of Mozartians, brings eminent delicacy to her singing but has the strength of voice to ride over the orchestra in both the Dies Irae and Libera me as she punches out her thrilling high Cs. This is great singing without question. If there is a reason why this quartet is more successful than almost any other it is because the voices have the dexterity to meet the demands of Verdi's writing. Price has the lightness of tone which Schwarzkopf brought to her recordings with de Sabata and Giulini, but, unlike Schwarzkopf, Price also has that reserve and power which she later brought to Wagner in a celebrated Tristan with Carlos Kleiber. If there is a problem with the casting of this particular part in recent years it is because conductors favour lyric sopranos rather than dramatic ones - Renée Fleming being a case in point. Beautiful though her singing is for Gergiev, one is constantly aware that the reach of the role is often too uncomfortable for her voice. Norman, however, comfortably spans both the mezzo and soprano registers so effortlessly that there is never the slightest suggestion that the voice is under any strain. It is imperious singing that really makes this disc essential viewing. Holding all this together is an inspired Claudio Abbado. His mastery of the score is never in doubt, his handling of the chorus superb, and he encourages from the LSO hugely dynamic playing (the brass are truly thrilling). His perception of the work owes more to Riccardo Muti than Giulini - this is, after all, an electrifying reading which rests on spontaneity rather than over-preparedness. It is a classic 'Italianate' performance played with warmth of expression, but is highly dramatic where it matters. Humphrey Burton, the director of this film, brings some nice touches to the performance. Where we hear the brass chorales in the Dies Irae the camera pans to cherubim blowing trumpets, and there are some exceptional wide-panned views of the stage which emphasise the enormity and grandeur of the work's structure. Here we have an orchestra and chorus marshalled on stage like a waiting army. Close-ups of both singers and conductor are judicious (and much less intrusive than in some DVD releases of concert performances). As ever with Arthaus the booklet is a disappointment: the translation into English is stilted and it tells us nothing at all about the performance (even the biographies of the principals are breathtakingly short). The disc is perfectly fine, with picture and sound quality matching the performance. Although the box tells us that there is a trailer for this performance I have yet to find it. This is a DVD that listeners will return to again and again for a performance that ranks amongst the very greatest ever committed to disc. It will not disappoint.